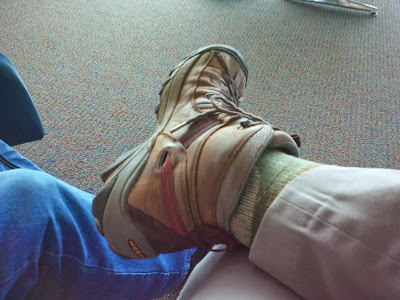 Okay, so I hand my passport to the TSA agent at Manchester (N.H.) Airport, and she says, "Are you performing somewhere?" Performing? Turns out she recognizes me as the guy who "does all the silent films." Wow, recognized at the airport! That's the closest I'll ever get to feeling like a rock star. I'll be back to doing music for silent film soon enough, though, and will resume reports prior to what promises to be a busy August. For now, let me see if I can post a picture of the hiking boots I'm wearing using my trusty old BlackBerry. Here goes! double bill on Sunday, July 20 in Wilton, N.H.
Two fans pay their respects at Strongheart's Star on the Hollywood Walk of Fame. No lifting of legs, please. These two silent-era canine performers will be raised from obscurity, if only for an afternoon this weekend, as we present a double feature of their best work. The show takes place on Sunday, July 20 at 4:30 p.m. at the Wilton (N.H.) Town Hall Theatre. Admission is free, with donations encouraged. It's all part of our ongoing "All-Star Animal Silent Film Extravaganza" this summer at the Town Hall Theatre. 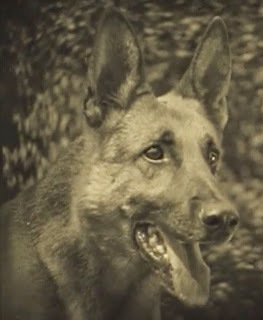 In 'The Return of Boston Blackie' (1927), Strongheart the German Shepherd plays sidekick to the notorious jewel thief, freshly out of prison and trying to turn over a new leaf. I understand this is the only surviving film of Strongheart, which is kind of sad. Of the two, Strongheart's name has endured longer, if only because of a marketing tie-in that continues to this day. Yes, Strongheart may have gone to that great dog run in the sky back in 1929, but you can still buy cans of "Strongheart Dog Food" wherever fine dog food products are sold. Like Rin Tin Tin, Strongheart fathered a great many puppies. The line apparently continues to this day. So if any Strongheart descendants are out there, come see your long-dead ancestor romp across the big screen! "After Strongheart's death, J. Allen Boone wrote two books, Kinship with All Life and Letters to Strongheart, about animal communication and the survival of the dog's soul after death. Both books were reprinted many times and remain classics of the Spiritualist faith." 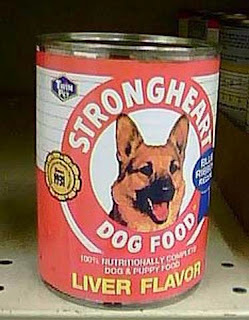 Strongheart, if you're watching this weekend, I hope the show makes your tail wag. Okay, just a brief note to encourage folks to head on down to the Leavitt Theatre in Ogunquit, Maine on Thursday, July 17. Why? 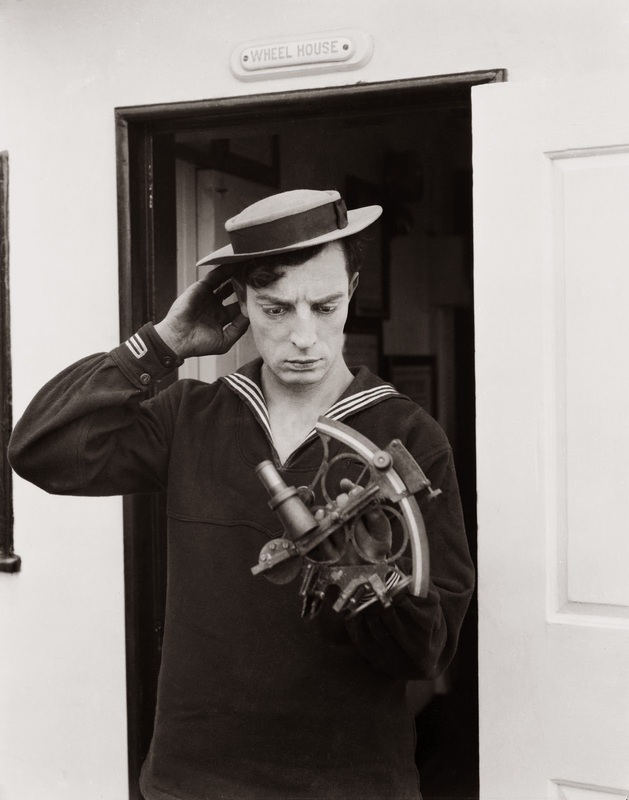 Because at 8 p.m., we're screening one of the great movie comedies ever made: Buster Keaton's 'The Navigator' (1924), with live music by yours truly. And rather than go on and on, here are 10 reasons to see it. 1. Showtime is at 8 p.m., which means you have the whole day to enjoy the beach, and then dinner in one of Ogunquit's fine restaurants, and still have plenty of time to catch the show. 2. It's being shown at the Leavitt Theatre, a vintage moviehouse that's even older than 'The Navigator.' (It opened in 1923.) In all these years, the place hasn't changed much at all, so it's a real throwback to what theaters were like before the advent of the multiplex. 3. It's a great example of 'found' comedy. Buster and his crew started with getting use of the ocean liner first, almost by accident, and went from there. They created a story (and all the gags with it) around the ship, so 'The Navigator' has a wonderfully organic feel to it. Sequence after sequence comes clearly from what Buster and his team found on board The Buford. 4. Speaking of The Buford: the ship used in 'The Navigator' is an interesting piece of history all by itself. Prior to becoming Keaton's biggest prop, it was used by the U.S. Department of Justice and Department of Labor to deport 249 non-citizens (including activist Emma Goldman) to Russia from the United States because of their alleged anarchist or syndicalist political beliefs. 5. 'The Navigator' contains some underwater sequences that are, well, groundbreaking. To get them, Keaton went up to Lake Tahoe, where the water is clear but freezing cold, and shot footage around a mock-up of the ship's exterior. 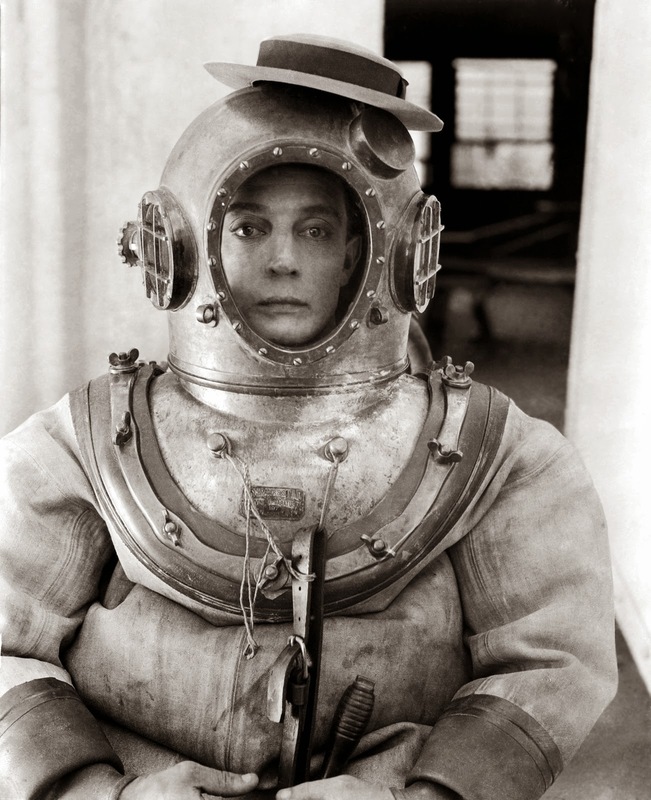 It's clearly Keaton in the bulky diving suit, and his ability to get laughs while even under the most rigorous and demanding physical conditions is really something to see. 6. The program includes a rarely screened Keaton short comedy called 'The Boat.' It's a kind of warm-up for what would come later in 'The Navigator,' and is full of Keaton's unique brand of physical comedy. 7. The musical accompaniment is live and made up right there on the spot. I sometimes neglect to play up this angle because the main focus should be on the film, which the music should support. But the improv element really does add a certain freshness and immediacy to a silent film screening that makes it different from other movie-going experiences. 8. You just have to see Buster in his old-school deep-sea diving gear. 9. The Leavitt Theatre now has a liquor license, and has even set up a small bar to serve drinks way up in the back of the theater. 10. 'The Navigator' is funny. Really. But it's only really as funny as it ought to be when seen on the big screen, and with live music, and with a live audience, as it was intended to be shown. See for yourself by joining us on Thursday, July 17 for this screening at the Leavitt Theatre. If you'd like more info, the press release is below. Hope to see you at 'The Navigator,' and at all the upcoming films that make up the Leavitt Theatre's silent film series this summer. 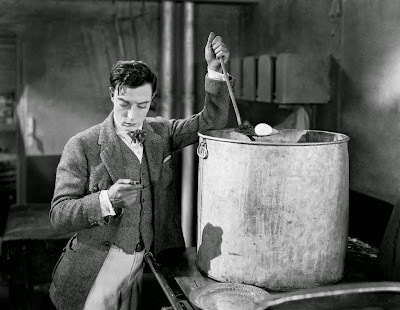 Buster tries boiling an egg in 'The Navigator' (1924). OGUNQUIT, Me.—He never smiled on camera, earning him the nickname of "the Great Stone Face." But Buster Keaton's comedies rocked Hollywood's silent era with laughter throughout the 1920s. Acclaimed for their originality and clever visual gags, and also admired for their authentic location shots and amazing stunts, Keaton's films remain popular crowd-pleasers today. 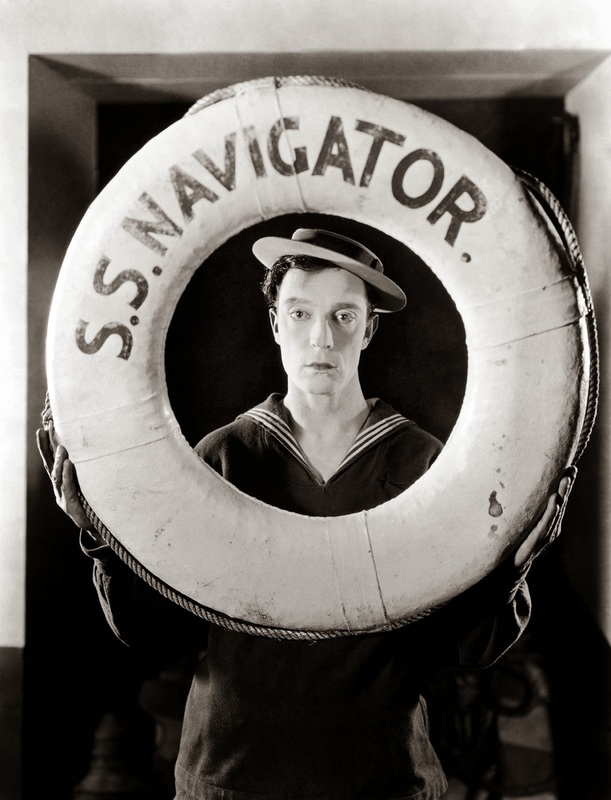 See for yourself with a screening of 'The Navigator' (1924), one of Keaton's landmark feature films, at the historic Leavitt Theatre on Thursday, July 17 at 8 p.m. The program, part of a series of silent film programs at the Leavitt, will be accompanied by live music performed by Jeff Rapsis. Admission is $10 per person. The Leavitt Theatre, which recently converted to digital projection for first-run features, is a moviehouse that has been in continual operation since opening in 1923. 'The Navigator' follows the adventures of wealthy nitwit Rollo Treadway (Keaton) and his pampered girlfriend, who find themselves adrift alone on a massive ocean liner. Forced to fend for themselves without servants, the pair attempt to cope with day-to-day life, creating classic comedy in the process. But when the ship runs aground on a remote island inhabited by cannibals, is Buster's resourcefulness enough to save the day? Filmed at sea on a real ocean liner that Keaton turned into the largest prop in comedy history, 'The Navigator' has been hailed as one of the most original and distinctive movies to come out of silent film's golden era of comedy. 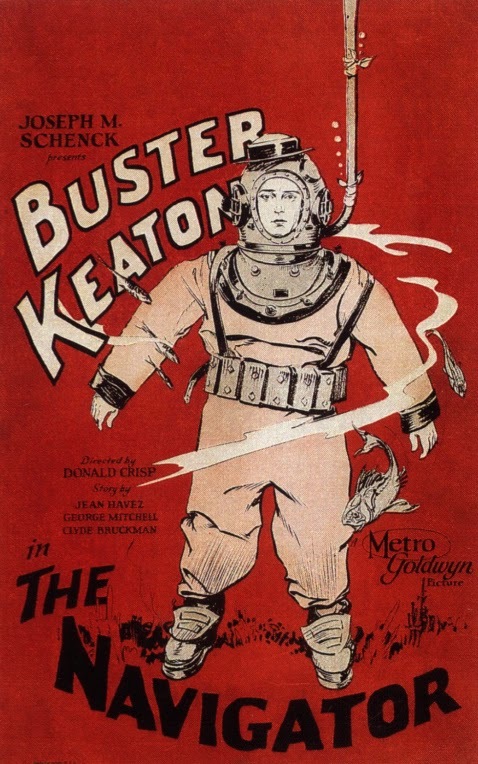 The film was highlighted by underwater scenes, with Keaton in an oversized antique diving suit, that were revolutionary at the time. Rapsis, a New Hampshire-based silent film musician who accompanies shows at venues across New England, said Keaton's films weren't intended to be shown on television or viewed at home. In reviving 'The Navigator,' the :eavitt Theatre aims to show silent film as it was meant to be seen—in high quality prints, on a large screen, with live music, and with an audience. "All those elements are important parts of the silent film experience," said Rapsis. "Recreate those conditions, and classics of early Hollywood such as 'The Navigator' leap back to life in ways that audiences still find hugely entertaining." "What I do is something of a high wire act—kind of like 'Who's Line Is It Anyway' for film scoring," Rapsis said. "But it definitely creates a one-of-a-kind spontaneity that reflects the energy of the film as well as the audience's reaction to it." Following 'The Navigator' (1924) on Thursday, July 17, the Leavitt's silent film series continues through October. All films will be screened with live music by Jeff Rapsis. • Thursday, Aug. 7, 2014, 8 p.m.: 'Peter Pan' (1924). Celebrate summer with the original silent film adaptation of J.M. Barrie's immortal tale of the boy who wouldn't grow up. Join the Darling children as they follow Peter to Never Never Land to do battle with the evil Captain Hook. A film that has lost none of its power over children of all ages. • Thursday, Aug. 28, 2014, 8 p.m.: 'Charlie Chaplin Comedy Night.' Spend an evening with the Little Tramp on the 100th anniversary of his first screen appearances. The whole family will enjoy restored prints of some of Chaplin's most popular comedies shown the way they were intended: on the big screen, with live music, and an audience! • Thursday, Sept. 18, 2014, 8 p.m.: 'Tarzan Double Feature.' In 'Tarzan and the Golden Lion' (1927), an early screen adaptation of the Edgar Rice Burroughs novel, finds Tarzan adopting an orphaned lion cub, with unexpected results. Other Tarzan feature to be announced. • Saturday, Oct 25, 2014, 8 p.m.: 'Phantom of the Opera' (1925). Long before Andrew Lloyd Webber created the hit stage musical, this silent film adaptation starring Lon Chaney helped place 'Phantom' firmly in the pantheon of both horror and romance. Just in time for Halloween! The program is subtitled 'Chiller Theater' due to the theater's lack of central heating. 'The Navigator' (1924) starring Buster Keaton will be screened in 35mm with live music on Thursday, July 17 at 8 p.m. at the Leavitt Fine Arts Theatre, 259 Main St. Route 1, Ogunquit, Maine; (207) 646-3123; admission is $10 per person, general seating. For more information, visit http://www.leavittheatre.com. For more info on the music, visit www.jeffrapsis.com. "The Navigator looks and feels like it could be one of today's summer mega-blockbusters. It has a great, simple premise that includes the destroying of a huge set. It's endlessly imaginative, funny, inventive, etc. It's one of the greatest movies I have ever seen." "His comic timing is brilliant. He says more in his face than most actors today do with their face and voices. It's a very funny story with dozens of very memorable comic scenes. A true classic." Today's sermon is on director D.W. Griffith. But first, a funny story involving me and law enforcement—no, not the Keystone Kops! So I'm heading up Interstate 89 on Saturday afternoon, on my way to accompany the monthly silent film program in Brandon, Vt., when I notice I'm running low on gas. No problem, I think. A few miles ahead is Exit 13, where there's not much, but there is an Irving gas station. So I can fill up there. Except as I get near the exit, a clot of slow-moving vehicles is blocking both lanes. When the passing lane finally opens up, I figure I have time to get back, so I make my move. And just as I accelerate, we enter a down-grade, and wouldn't you know, a state trooper is right there, running radar. Cripes! And as I pass by, I see his lights go on, and I figure I'm done for. Oh, well. I'm on the road a lot, so I figure I'm bound to get stopped once in awhile. I pull back in the right lane and resume 65mph, looking in my rear view mirror to see the cop come around the bend behind me with blue lights flashing. And then there's Exit 13, which I was planning to take. So I do. Down I go, stopping at the stop sign, and then drive down the road to the Irving Station, which is in plain view of the highway. I get as far as starting to fill my tank when I see a green state police cruiser go flying up the highway in the direction I was traveling. (No lights on, though.) Was he looking for me? And was I in trouble for evading an officer of the law? I didn't really want to find out. So after filling up, I went into the store, which turns out is not a convenience store but a pretty substantial local grocery store, complete with deli counter. Worth checking out, I thought, especially if I'm on the lam. Thus did I spend more time than usual inspecting the produce before finally deciding on a package of sunflower seeds. And when I got back on the highway, no trooper in sight. Was he not after me after all? Either way, as I felt the feeling of having escaped take hold, I was reminded of something I once heard attributed to Winston Churchill: "There is nothing as exhilarating as getting shot at and missed." Saturday's screening was a real rush, as they always are in Brandon. Strong response for a Keaton program featuring 'The Navigator' (1924); attendance of more than 100 people, the best so far this season. This was followed on Sunday by a matinee screening of D.W. Griffith's 'Orphans of the Storm' (1921) in 35mm at the Somerville Theatre in Somerville, Mass. "Coming in here, I heard on the radio that this afternoon's World Cup Final between Germany and Argentina would be watched by more than 1 billion people. And then there's you folks..."
The print was missing the very opening scene (where Henrietta's father gets stabbed) and it seemed to run a tad rapidly at 24fps, which made some of the dramatic scenes seem comically rushed in that way that reinforces unfortunate stereotypes of silent film. But still, the power of Griffith to command an audience's attention once again trumped any concerns. And perhaps here is the place to at least outline an aspect of Griffith's genius that I think has been completely overlooked as the years have passed. Here's the thing: for more than 20 years prior to working in motion pictures, Griffith was a man of the theater. More specifically, he was a man of the small-town theater, directing touring companies in melodramas that toured small town theaters in one-night stands. As you might imagine, to do this successfully, you HAD to hook an audience early and give it what it wanted. If you didn't, there would be real consequences. They'd throw things, or possibly run you out of town on a rail. So Griffith developed in his bones a keen sense of what it took to mesmerize an audience. And he carried this into the then-new art of motion pictures, where such knowledge was just as crucial. Think of it. If the people making pictures (such as Griffith) did not know how to tell a story and hold an audience, motion pictures might never have developed the massive and quick following they did. In presenting silent films to live audiences, I've seen this happen again and again. A Griffith film such as 'Way Down East' (1920) that seems creaky and old and dull when viewed alone is utterly transformed by the presence of an audience to react to it, and to itself. It somehow magnifies everything, making the presence of an audience a crucial part of the cinema experience, and a key reason (I think) why people really did fall fast and hard for the movies. Griffith understood how this worked, and he baked this knowledge (a combination of mob psychology and crowd control) into most of his big pictures, guided at the time probably just by his own instincts of showmanship and sense of what would work. At the same time, however, he was just creative and open-minded enough to recognize that motion pictures help new possibilities for narrative and story-telling that went beyond what could be done on stage. And so he was among the first to employ innovations such as split-screens, rapid editing, shots of differing distances, and so on. Griffith has always gotten a lot of credit for such innovations. But none of it would have mattered if he hadn't been rooted in the melodrama stage tradition all along, creating stories that audiences simply were powerless to resist. So in the way Griffith brought the crucial and vital elements of the theater into the world of motion pictures, but then also made use of new tools in a new art form, he stands as a hugely important and pioneering figure in cinema. To me, Griffith occupies a similar position to that of Beethoven in music. Beethoven grew up in the disciplined Classical tradition of Mozart and Haydn, but then pushed the idiom and language to a whole new level that made possible the era of Romanticism that was to follow. Of course in due time, Griffith's rather old-fashioned style (and Victorian morality) was superceded by new directors in the 1920s, many of whom pushed the possibilities of cinema much further, and many of whom were not hamstrung by the kind of deep traditional stage background that Griffith had. But still, would they have been able to do what they did if Griffith hadn't shown the power of the medium to hold an audience in the first place? No one can say for sure, but I think it's safe to say that Griffith was the right man at the right time to get the movies jumpstarted from nickelodeon to the art form of the 20th century. And it was not just because he pioneered many of the techniques that would become the language of cinema. It's also because he knew how to keep an audience on the edge of its seats, and that aspect of his craft should be neither underrated nor forgotten. The best proof of this? Just run a D.W. Griffith film the way it was intended: with live music and in front of an audience, the larger the better. As long as people still gather in one place to watch a movie together, they still work. And they probably always will. See 'Orphans of the Storm' (1921), D.W. Griffith's sweeping drama set during the French Revolution, in 35mm on Sunday, July 13 at 2 p.m. at the Somerville Theatre, Davis Square, Somerville, Mass. Okay, I have something about silent films and theater schedules and live music to get off my chest. But first, an update on the latest. This evening I head up to the Flying Monkey Moviehouse in Plymouth N.H. to do music for a screening of Keaton's 'The General' (1926) at 6:30 p.m., and then get to catch my breath prior to weekend shows way up in Vermont and way down in Boston. In Vermont, it's a Buster Keaton program on Saturday, July 12 at 7 p.m. at the Brandon (Vt.) Town Hall. And down in Boston, it's 'Orphans of the Storm' (1921) in 35mm on Sunday, July 13 at 2 p.m. at the Somerville Theatre in Davis Square, Somerville, Mass. Last night we had a surprisingly intense screening of 'The Scarlet Letter' (1926) directed by Victor Seastrom and starring Lillian Gish. A much-bigger-turnout than expected contributed to the excitement, I suppose, but the film itself really came across. Alas, it only exists in a version that's half camera-negative (which looks beautiful) and half blurry 16mm print-down, which is a shame, because the film has such visual power throughout. Let's hope the missing material turns up in pristine form someday. For now, 'The Scarlet Letter' is a vivid demonstration of how different a film can be when it's too many generations away from the original. In the sections of 'The Scarlet Letter' take from the 16mm print, there's almost no detail visible on faces, and so the acting just doesn't register. It's more like a dance of puppets. But in the pristine sections, the performances of Gish and her co-stars all instantly leap to life. With the original material of so many films gone forever, it's important to remember this distinction when watching any movies from the early days of cinema. Good or bad, they all looked great. Otherwise, people would not have fallen in love with them. Right? Looking ahead, it's the screening of 'Orphans of the Storm' on Sunday, July 13 that I'm most interested in promoting. And one reason for that is because another Boston-area theater has decided to schedule a big silent film program on exactly the same day and at exactly the same time as our long-planned event. Yes, I'm glad that Boston is a big enough city to support such robust silent film programming. However, the audience for this art form is limited. And by forcing people to choose one screening over another, neither screening will get the total attendance it should have. So what? Well, this robs the films of their respective impacts, which depend on a critical mass of viewers. But it also perpetuates the idea that few people are willing to attend or support such programs. After all, look at all the empty seats! So, in an age of instant downloads and audiences of one, can't theaters trying to keep the cinema experience alive at least coordinate their offerings? And a sad side note to this situation is that the other theater is using recorded sound rather than live music to accompany their silent program. I know it sounds self-serving to point this out, but live music is truly essential to the silent film experience, and it's disappointing to see that some knowledgeable theater operators just don't understand that. Maybe it's cheaper to show a film with a recorded soundtrack. (Of course it's cheaper!) Or maybe they've had bad experiences with live accompaniment that just wasn't effective. I don't know. Maybe it's just easier to use a recorded soundtrack than having to hire and coordinate and work with crazy musicians. I must say the people who restore and reissue certain silent titles are contributing to the problem. By distributing DCP versions of great classics with convenient recorded scores, and touting them as a whole package and how great the score is, they encourage theater operators to take the easy way out and dispense with live musicians. Again, I know it sounds self-serving. But film restoration people and theater operators alike ought to understand the intrinsic value of using live music for a silent film rather than a recorded score. You wouldn't watch a play where the actors all lip synched their lines to a pre-recorded dialogue track, would you? So for silent film, you shouldn't expect a recorded track to function as a substitute of equal value to live music. It's not. Okay, off my soapbox. So, with a bit more feeling than usual, I urge you to see 'Orphans of the Storm' (1921), D.W. Griffith's French Revolution epic, in 35mm and with live music on Sunday, July 13 at 2 p.m. at the Somerville Theatre in Davis Square, Somerville, Mass. Ladies of the French aristocracy suffer through a big hair day upon the occasion of peasant girl Lillian Gish arriving in their midst. SOMERVILLE, Mass.—Heat up Bastille Day this year with the fire of revolution! 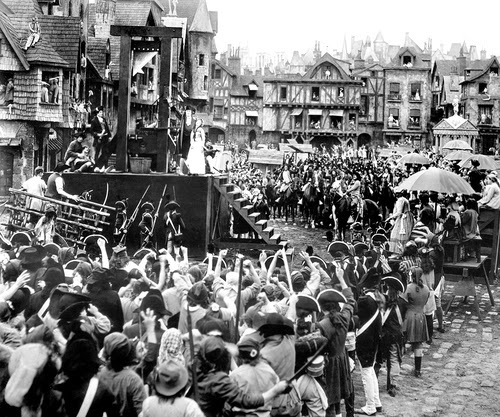 'Orphans of the Storm' (1921), a sweeping silent film drama set during the uproar of the French Revolution, will be shown with live music on Sunday, July 13 at 2 p.m. at the Somerville Theatre, 55 Davis Square, Somerville, Mass. Admission is $15 per person. The movie will be screened in 35mm and accompanied by live music performed by New Hampshire silent film composer Jeff Rapsis. 'Orphans of the Storm,' set in 1780s France, follows the story of two sisters, one blind, who seek to cure her vision by risking a trip from their country village to Paris. There, they are soon separated as anarchy erupts, the aristocracy is toppled, and the city is engulfed by the unpredictable chaos of revolution. Will fate reunite the two sisters before the guillotine separates them forever? The film, part of the Somerville's monthly 'Silents, Please!' series, is being shown in part to mark Bastille Day (July 14), a holiday in France known as La Fête Nationale that celebrates the storming of the notorious Bastille prison in Paris in 1789 as a symbol of the French Revolution. 'Orphans of the Storm,' directed by legendary silent film pioneer D.W. Griffith, features dramatic mob scenes of revolutionary Paris filmed on a massive scale. Also, the story builds towards a spectacular and fast-moving race-to-the-rescue climax that wowed audiences in 1921, making 'Orphans of the Storm' one of the year's biggest hits. Leading roles in 'Orphans of the Storm' are played by two actual sisters, Lillian and Dorothy Gish, both major stars of Hollywood's silent era. Lillian Gish, an iconic actress of the silent era, went on to a career that lasted long enough to include an appearance on 'The Love Boat' television series in the 1980s. She died in 1993 at age 99. Younger sister Dorothy Gish also enjoyed a productive career that included stage, film, and television roles into the 1960s; she died in 1968 at age 70. 'Orphans of the Storm' was the last in a string of successful blockbusters helmed by Griffith, who pioneered large-scale historical epics with films such as 'Birth of a Nation' (1915), 'Intolerance' (1916), and 'Way Down East' (1920). Though he continued making films, Griffith was superseded the 1920s by a new generation of filmmakers willing to take his innovations even further, creating the foundation of the motion picture industry we know today. Although 'Orphans of the Storm' was released nine decades ago, critics today say Griffith's French Revolution epic holds up well for modern viewers. Leonard Maltin praised the film's "lavish settings and race-to-the-rescue climax," judging it "still dazzling." Critic Jeremy Heilman of www.moviemartyr.com wrote "the sheer amount of realized ambition on display in it makes it a sight to behold." 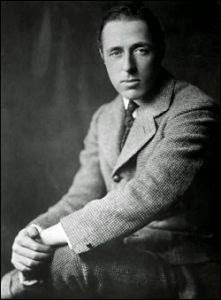 About D.W. Griffith, film historian Kevin Brownlow summarized his genius by writing, "however skillful the other early directors might have been, none of them knew how to project anything but the most basic emotions until Griffith showed them. And it was emotion, rather than close-ups and fade-outs, that made the people of the world fall in love with the moving picture." The screening of 'Orphans of the Storm' will be accompanied by an improvised score created live by silent film musician Jeff Rapsis. Rapsis achieves a traditional "movie score" sound for silent film screenings by using a digital synthesizer that reproduces the texture of the full orchestra. • Sunday, Aug. 10, 2 p.m.: 'Chaplin Short Comedies' starring Charlie Chaplin. Program includes 'A Dog's Life' (1918), 'Shoulder Arms' (1918), and others. Spend an afternoon with the Little Tramp on the 100th anniversary of his first screen appearances. The whole family will enjoy restored prints of some of Chaplin's most popular comedies. • Sunday, Sept. 14, 2 p.m.: 'The Kid Brother' (1927) starring Harold Lloyd, Jobyna Ralston. Often cited as Lloyd's masterpiece, this ambitious silent film comedy/drama tells the story of Harold Hickory, youngest son of a powerful rural sheriff. When his father is unjustly jailed, Harold is forced to prove himself and clear his father's name. • Sunday, Oct. 5, 2 p.m.: 'The Crowd' (1928). Director King Vidor's acclaimed drama about the life of an everyman who aims high, but life has other ideas. Released by MGM near the end of the silent era, and filled with iconic scenes showing the eloquence of silent film at its most fluent. • Sunday, Nov. 16, 2 p.m.: 'The Strong Man' (1926) starring Harry Langdon. With World War I over, baby-faced soldier Harry Langdon searches for the girl who sent such moving letters to him in the trenches. Directed by a very young Frank Capra, 'The Strong Man' is today hailed as Langdon's best feature, and also one of the greatest comedies of the silent film era. 'Orphans of the Storm' (1921) starring Lillian and Dorothy Gish will be screened in 35mm with live music on Sunday, July 13 at 2 p.m. at the Somerville Theater, 55 Davis Square, Somerville, Mass. General admission is $15 adults, $12 students/seniors. For more information, call (617) 625-5700 or visit www.somervilletheatreonline.com. Two screenings of 'The Lost World' (1925) in the past few days gave rise to a few thoughts worth preserving. Fossils, if you will. I usually end up introducing the shows I do, with the comments often as improvised as the music that follows. But once in awhile, apart from the usual blah-blah-blah, I find myself saying something that actually sounds worth pointing out. In the case of 'The Lost World,' the random slot machine of my addled brain came up with an interesting notion, which was this: how fitting for a story about an extinct creatures to be told in an extinct art form. Dinosaurs and silent film. What a poetic combination! But then I had another thought. 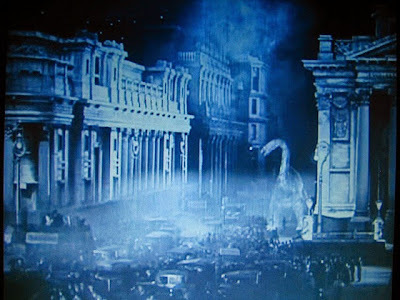 Just as the early filmmakers brought the dinosaurs back to life (at least on screen), so would we (me and the audience) help bring silent film to life. It was an interesting way of making a point I try to make: that these films were designed from the ground up to be seen a certain way. You need live music, you need a big theater, you need a big audience. Take any of those away and you're not going to understand why people first fell hard for the movies. 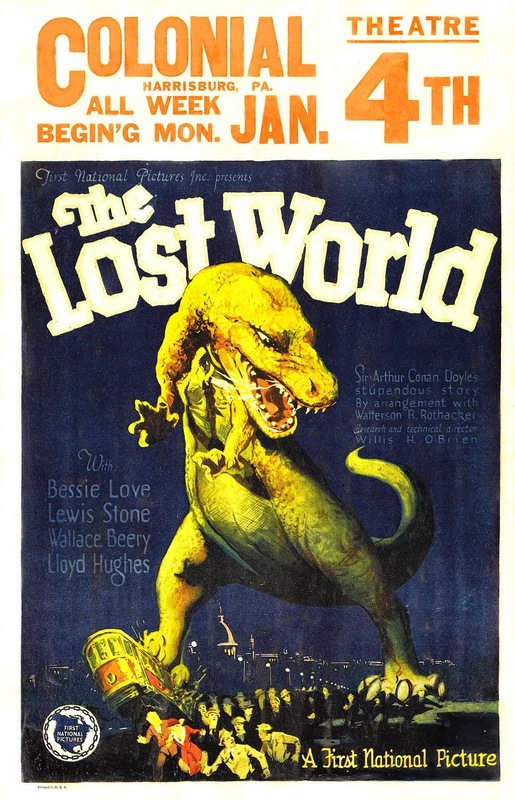 Yesterday's screening of 'The Lost World' was part of a double feature at the Wilton (N.H.) Town Hall Theatre that included 'Tarzan and the Golden Lion' (1927). We had a surprisingly big turnout for a holiday weekend and fine weather (something like 100 people) and the reaction was strong throughout. And I don't know. Sometimes I just let loose, and that's what happened with the Tarzan film, which came first. I really hadn't prepared anything so I started big and never looked back. And rather than become tiresome, the approach seemed to be just right. Maybe it's because 'Tarzan and the Golden Lion' is that kind of film: pretty much non-stop action. I was concerned that I had unloaded too much prior to 'The Lost World,' but that turned out to not be the case. Something about the structure and the pacing of 'The Lost World' provided the break we all needed. I believe the way the story unfolds, with an extended all-human prologue in London and then the Amazon jungle before the stop-motion dinosaurs make their first appearance, really helped. So when I amped things up once the exploration party makes it to the plateau, everyone's ears (including mine) were ready for some big stuff again. And I have to say that one of the best moments in all silent film is the first sight of the escaped brontosaurus stomping around central London to create the film's climax. Audiences see this and just go crazy, which is what happened Sunday afternoon in Wilton. There's something about this moment, knowing that it's setting the stage for a century or more of movie mayhem to come, that people feel compelled to cheer. Complete info for each show can be found by clicking 'Upcoming Silent Film Screenings' page at upper right. Hope to see you at a screening real soon!